Microsoft has come up with a new version of Windows; the version is Windows 10. If you are currently using Windows 7 or 8 on your computer, you can just upgrade it to Windows 10 from scratch or install a fresh copy of Windows 10. How to do it? 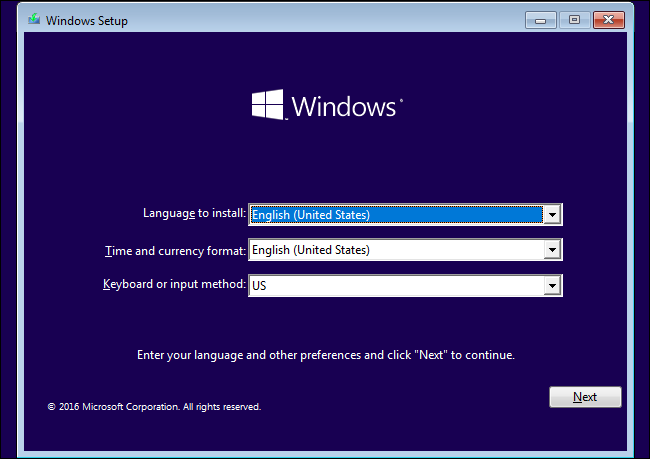 In this page, we will discuss how to install Windows 10 in several ways. Plus, we will tell you how to get a Windows 10 license. There are several ways to get a Windows 10 license for your computer and we are going to discuss them all in this section. If your current PC has Windows 7 or 8 installed and you are planning to upgrade to Windows 10, it is a good news for you. Microsoft offers a free upgrade for Windows 8 or 7 users who want to upgrage to Windows 10 by using the accessibility tools. Another way, you can insert the valid key for Windows 7 or 8 while upgrading to Windows 10. Then, the installer will find a way to get the Windows 10 license from the Microsoft’s server. When you have installed Windows 10 on your current PC, the Windows 10 license will be there forever. Even if you downgraded the Windows 10 to Windows 8 or 7, you can still upgrade to Windows 10 in the future. The Microsoft’s server will still remember or keep your license. 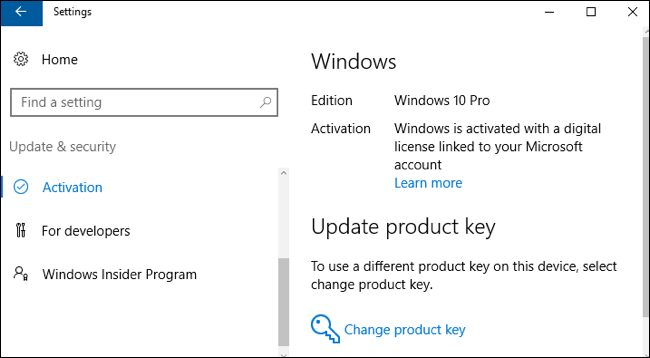 If you just purchased a new PC with Windows 10 installed, you will likely have a license key already. The key will embed into its UEFI firmware. So, when you want to reinstall the Windows 10 on your PC, you don’t need to insert the key again. Windows 10 will get the key from the chip on the motherboard. Another way to get a Windows 10 license is by purchasing the license from Microsoft. Just go to Microsoft Store official website and purchase a Windows license. Microsoft will then send you a key license and you can insert it on your Windows system. No license? No worries! Windows 10 can be installed on your computer even though you don’t have a product key. However, you will keep seeing messages saying your Windows 10 system isn’t licensed and needs to be activated. Even so, you can still able to use it. It is a great way if you want to test the Windows 10 to see whether you like it or the previous ones. 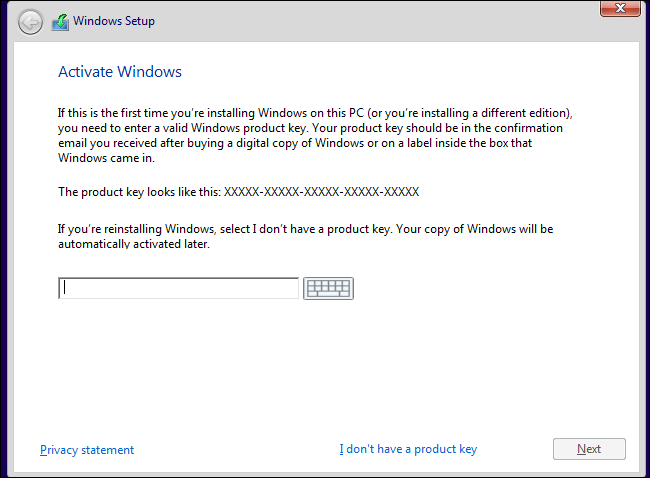 If you are interested to Windows 10, you can purchase for the product key to get it activated. Which methods that you want to get a Windows 10 license? Decide yourself! If you are still using Windows 8 or 7 on your computer and want to upgrade to Windows 10, Microsoft’s upgrade tool is the best tool that you can rely on. However, if after upgrading to Windows 10 and you don’t like it, you can downgrade it back to Windows 7 or 8. While if you have previously upgraded to Windows 10 on your computer and you downgraded it to Windows 8 or 7 and now you’ve changed your mind to upgrade it again to Windows 10, your computer might have a valid license. In this case, you can download Windows 10 tool in order to upgrade it to Windows 10. Hit the “Download Tool Now” and run it. Choose “Update this PC” and follow the instructions on screen to complete the installation. The progress will take for a while because the tool will download the Windows 10 installation files in advance. Then, the installation process will start. Make sure you have a stable internet connection. Upgrading Windows 10 from Windows 7 or 8 is not the only way. You can also perform a clean install if you don’t want to upgrade it from the previous version of Windows. The benefit of having a clean install is that it gives you a fresh start. It will also get rid of the bugs that you might have in the previous version. Just imagine that you have a fresh operating system on your machine. To perform the clean install of Windows 10, you can visit Microsoft’s Download Windows 10 page. Press “Download Tool Now” and run the file. Choose “Create installation media for another PC”. Select your language or the language that you want to use, edition, and architecture you want to install. Make sure you know your specs of your computer, whether it is 64-bit or 32-bit version. Check the type of your CPU if you don’t have any idea of your computer’s architecture. Don’t choose the wrong version. Otherwise, it won’t work well. It’s always best to select “Use the recommended options for this PC” box when you are installing Windows 10 in your computer. Then, the tool will download the right version of Windows for your computer. You can also copy the Windows 10 installation files to a flash disk or burn them to a DVD using the tool. Use at least 4GB for the flash drive and it should be empty because the copying process will wipe all the data in the flash drive. Select the ISO file option if you want to install Windows 10 using the virtual machine. The tool will download an ISO file. Then, boot from the downloaded ISO in the virtual machine to install Windows 10. After you have created an installation media using one of the methods (using USB drive, DVD or ISO file) above, insert them into the PC and boot from the installation media. Then, set your language, time and currency, and keyboard layout. Press Next to go forward. 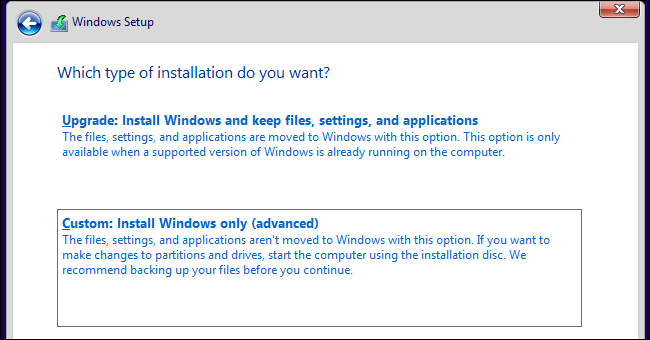 In the installer screen, choose Install Now and follow the instructions on the screen in order to install Windows 10. Now, in the Activate Windows screen, you can select either enter a key or skip it. This screen will not show up if Windows 10 has detected a key associated with your PC. You must activated the Windows 10 by inserting a key if you have never installed Windows 10 in your PC. If you don’t have a key, but you have a valid key for Windows 8 or 7, you can enter it here. If you have previously installed free Windows 10 upgrade on your PC, press “I don’t have a product key“. Then, Windows will activate with a digital license associated with your PC. After that, Windows will ask you about the type of installation that you want. press Custom to perform a clean installation and erase all data on your PC. (Select Upgrade if you want to upgrade from Windows 8 or 7). Here, you should choose the hard drive you want to install Windows on and format it. Before perform this, make sure that you have backed up all data in your computer to avoid data missing. The formatting partition process will delete all data or files in that partition. 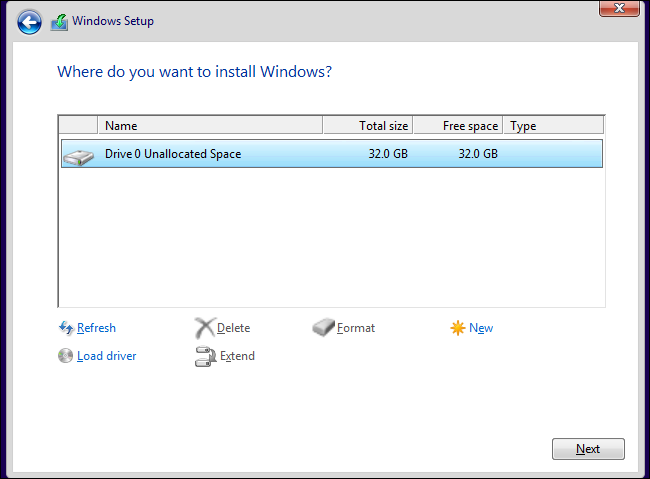 After all data in the partitions have been erased, you will see an “Unallocated Space”. Tap on it and press New, and click Next to format the partition. Then, Windows 10 will start to install itself. Your computer will restart a couple of times. Let this happens without interruptions. It may take for a while, so be patient with the process. Once it’s done, you will need to set up Windows 10. In this section, we are going to discuss how to re-install Windows 10 on a PC which already has Windows 10 installed. We can also call this as fresh install. Thanks to Windows 10’s Creators Update that makes it easier to install Windows 10. 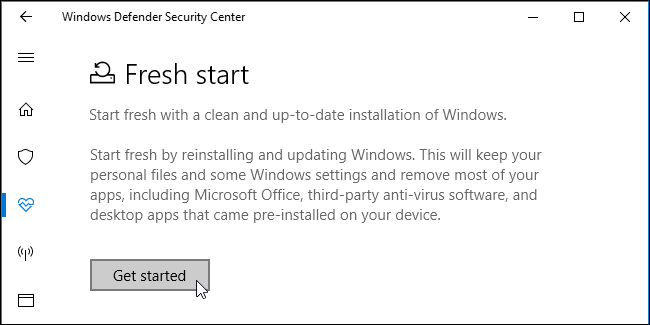 Select Fresh Start option in Windows Defender in order to have a fresh Windows 10 system. This way will erase all manufacturer-installed programs and leave you a fresh Windows 10 system. In the other hand, if you don’t have Windows 10 installed on your computer and prefer to install Windows 10 in an old-fashioned way, you can use the Download Windows 10 application to create Windows 10 installation media. Then, you can install it right away. During this installation process, you don’t need to insert a license key because it will be taken from Microsoft’s servers. That’s all about how to install Windows 10 and to get a Windows 10 license key. We do recommend you to purchase the original version of Windows 10. For any queries or suggestions, feel free to drop them in the Comments section below. Thank you for reading win10repair, Folks!